Holiday Gift Guide – Stocking Stuffer Favorites! Maison de Cinq’s Favorite Things Holiday Gift Guide! A couple of years ago a friend and I went to one of those Holiday Home Tours, you know the kind where you go to 5 or 6 houses and walk around oohing and aahing and looking at how they’ve decorated. One of the houses was clearly a standout above the rest. As we were walking through one of the houses, my friend commented, “I want my house to look like this! I think I need more antiques.” And it was true. Though many of the houses were pretty, most of them (this is the suburbs, after all) didn’t have a single piece of vintage or antique furniture of any kind in the entire house! Though I always suspected that an antique piece adds much needed character to a room, her comment really cemented in my mind how very important they are. There was a clear difference between the house that was truly gorgeous, and the other ones that were just nice. They were all decorated by professionals (most likely) and they were all large houses, so in this case, it was not about the money spent. It was about what the money was spent on. This is the part where I lose some of my friends, though. They think that if they add an antique, their house will look too old-fashioned. Or, they assume “antiques” are all really expensive. And really, nothing could be further from the truth. Of course a house that is all antiques, with old fashioned finishes and heavily patterned drapes, will look very outdated. And there are uber-expensive antiques out there. But there is definitely a way to add a piece (or two) without it going too “grandma-y” or breaking the bank. Kind of how I think a mostly antique room needs a modern piece to bring it to life (you can read my thoughts on that here), I also think every room can benefit from at least one antique or vintage piece. It makes the whole room look more collected, less catalog-y. And it’s better if there is a little character to the piece; the chippier the better, in my opinion. The texture is important here. You can use reproduction if you like (they do add some character), but I think in the end you are better off with the real thing. In fact, if you look closely, even catalogs like Pottery Barn add vintage items to their rooms in the photos. I’ve often loved something in their catalog, only to realize it’s not actually their item! They’ve added it because the rooms look better for it. The space is less predictable and more unique. 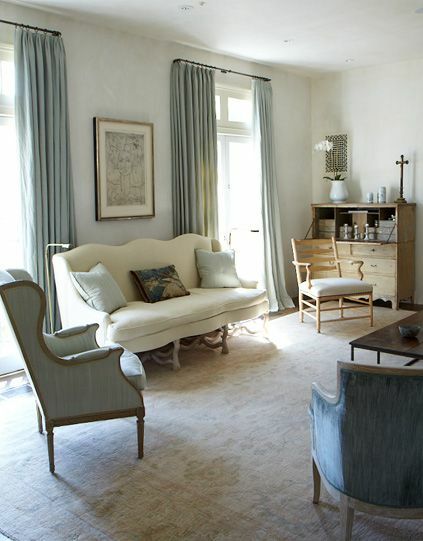 It adds depth and character, yet the room still remains hip and contemporary. It can be done! I think the antique desk adds so much to this space! Love that Mora clock! It may or may not be original, but it still adds a lot of character. Also, the floor is antique and is perfectly distressed. The chest in the corner makes this living room sing! 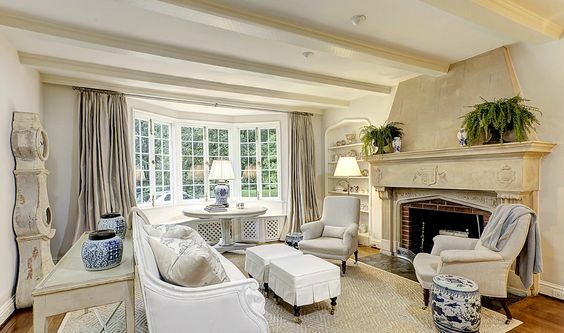 (And of course, that fireplace!) 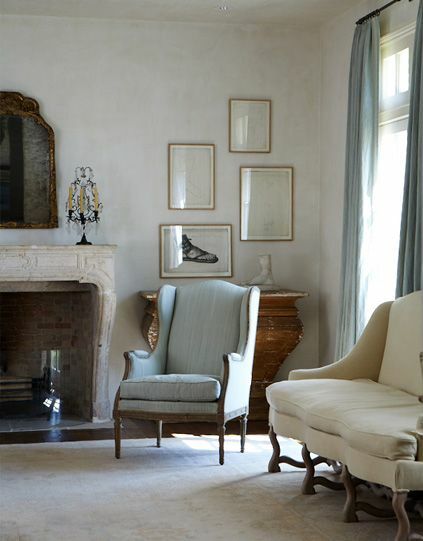 By the way, if you have a fireplace like that, or you live in some 19th century house with amazing moldings, you don’t need any antiques to add character to your house – you already have it! This looks like all newly purchased furniture and accessories so that Mora clock really takes center stage. Here it’s just the accessories that add that antique specialness. Imagine if that cupboard were filled with items from Pottery Barn, it just wouldn’t be the same. 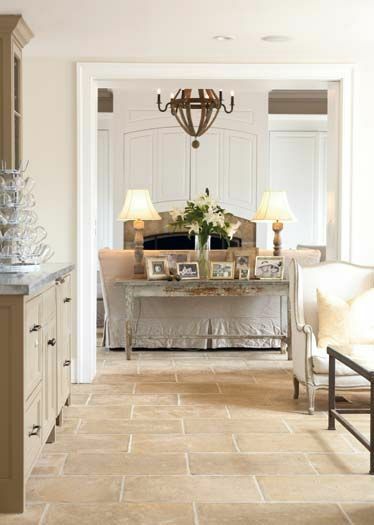 But the antique ironstone adds the right amount of age, while never making the room seem stuffy. This is a Pottery Barn catalog page. Notice the items on the wall; those street signs are vintage and not even for sale! But they look great! 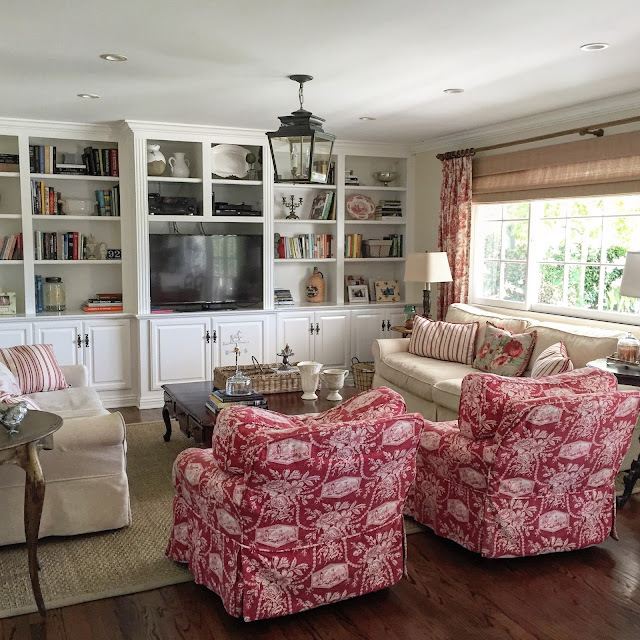 Here Kim of Savvy Southern Style uses those fabulous antique baskets to add character to the room. Love this! 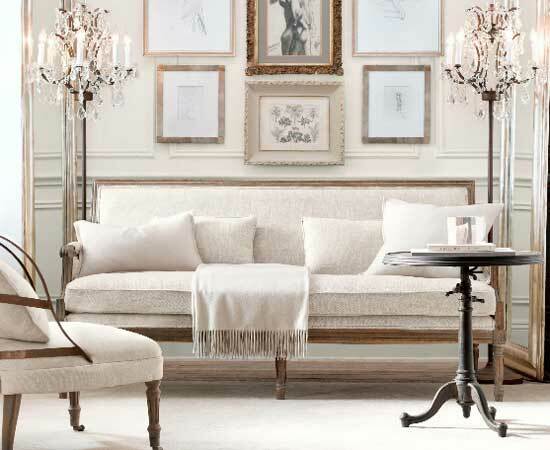 An all white room really needs antiques, simply because all that lack of color can become cold really quickly. Love that chippy antique armoire! Perfection! Absolutely love that antique armoire and what it does for this room! 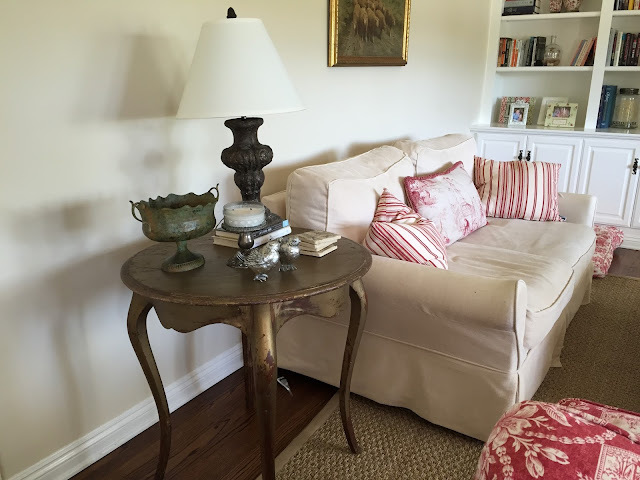 Love the heavily distressed sofa table! Truly, this space would be lacking something without it. 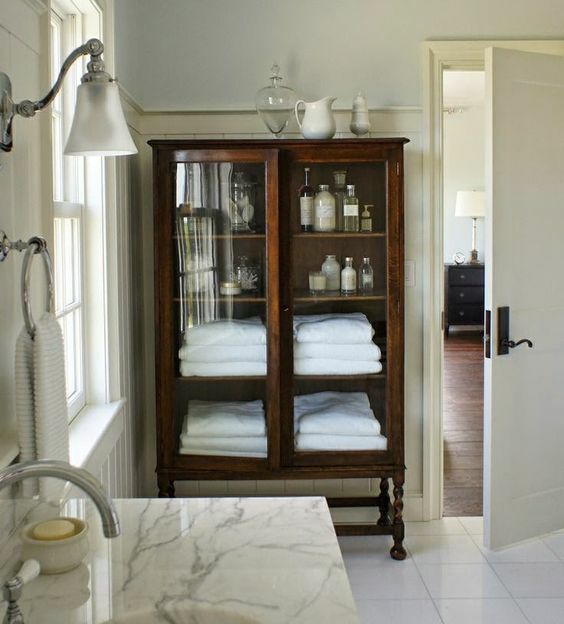 Antiques are gorgeous in a bathroom too! And they do the all-important job of making a utilitarian space warm. Large armoire/cabinet working it’s magic again! 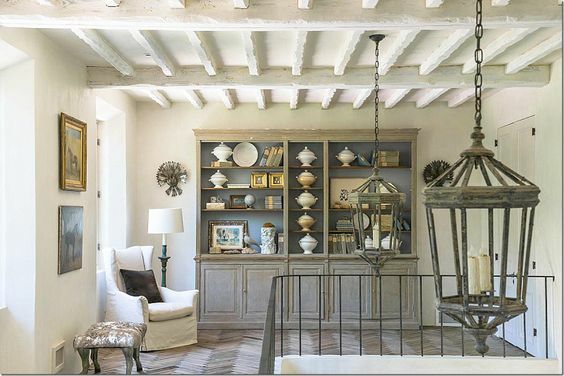 Another Pottery Barn catalog shot – and that shelf is not PB. 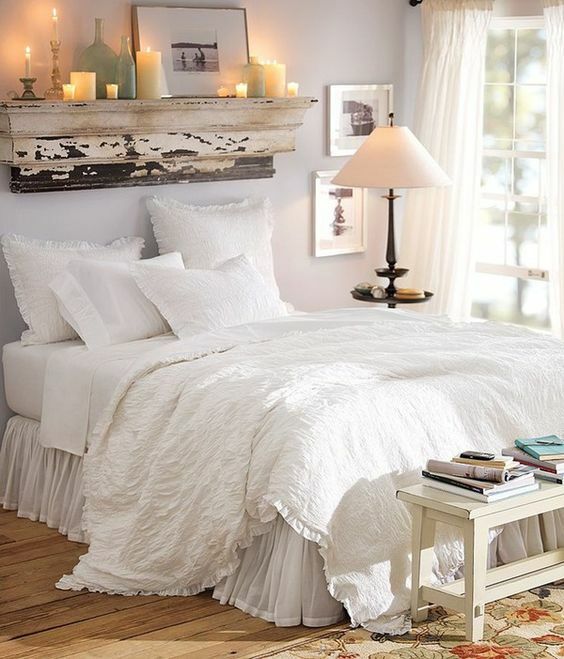 The antiqued/distressed shelf behind this bed makes the room! Designer Carol Glasser uses antiques sparingly in this dining room, with just the chandelier (and maybe the mirror) playing that role. But with a modern light fixture, this room would feel very redundant. Carol Glasser again – notice that chest in the corner. This bedroom could easily be full of Home Goods or Restoration Hardware finds, except that settee at the window. It may or may not be original, but it looks like an antique find, and it adds the right touch. Without it, the room does not have the same character. I adore this landing! The bookshelves and chair are clearly newer purchases, but the art and the ironstone are the much needed antique touches that take this to the next level. The beams do that job as well. 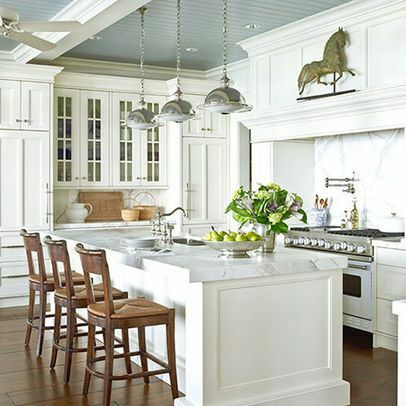 That original weather vane on the vent hood really adds that much needed oomph to this all-white kitchen. It’s great to add antique elements to a kitchen – even if the features and fixtures are pretty modern. Restoration Hardware catalog. 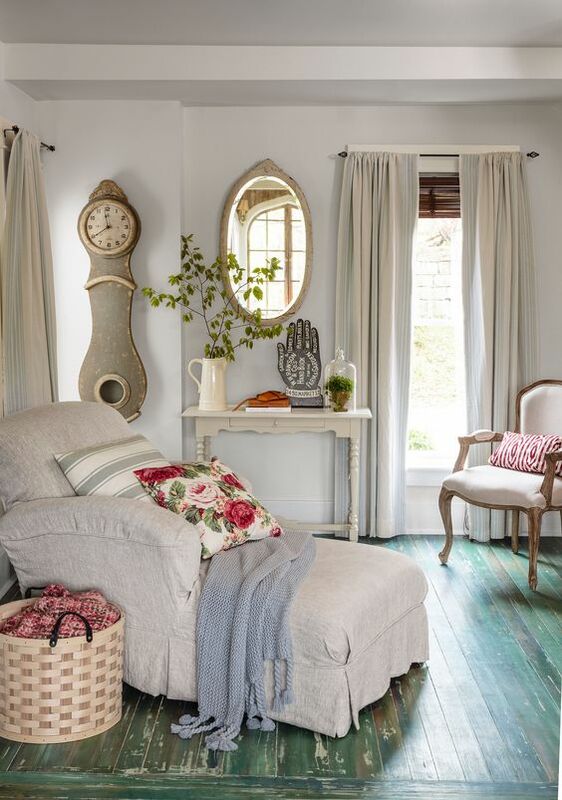 Just like PB, they add antiques to the vignettes to add character. Here, the antique art above that settee is not for sale, but boy, does it look gorgeous!! My living and dining rooms are not good examples of the “one antique in every room” tenant because they are full of antiques! However, until recently, my family room had absolutely none! I’d been feeling for awhile like that room was missing something, and I’m planning on changing the red accents to blue, but more than that, at some point I realized not one of the pieces of furniture in that room were antique or vintage. Not one! And it really was not looking as good as it could. Then when I was out antiquing one day, I found the little vintage table below. And as small of a change as it is, I really feel like it made a big difference in the room. The table that was there previously was a piece I never loved that I had purchased at Home Goods, so this slightly distressed, chippy piece was a definite improvement. I love the look of the table. The finish is the perfect level of distressing. At first I wasn’t sure I loved the color, but it has really grown on me. This room still has more new furniture than any other in the house, but I’m working on it! The side table is vintage, as is the new (old) coffee table. I’d also love to change out the dining table that sits behind this camera angle. If I do, I will definitely show you. I truly believe that every room needs an antique or vintage piece. The only furniture I’ve ever donated or tried to sell in a garage sale are the pieces I bought at Home Goods or some furniture store – never my antiques. Those I’ve moved around, or used in a different room, but they have really stood the test of time. That’s the best part – they never look dated! Aww, thank you so much!! I really appreciate that! Thank you Karen! Though I am changing the red to blue!! Let's see if you still like it! See? If we lived near eachother I would just take you shopping and force you into it!! And thanks so much for all your sweet words about my house, they mean so much! Thanks so much Jennifer! I appreciate you stopping by and for hosting the blog hop! Right?! I just don't think a room full of all new furniture has the same weight. Absolutely beautiful rooms. I will be featuring this tonight at my Winter Blues Wednesday party that opens at 8pm EST. Please stop by and pick up an I've Been Featured button. Thanks. My pleasure Kim! Your house is one of my absolute favorites – and you definitely mix the new with the old, which I love! Thanks so much for sharing my sun room baskets and linking up! I agree 100% There is a level of interest for me when there is a piece or two that has a story. I love the examples you've shared. Your room is so pretty. Red and white, a favorite combination for me. 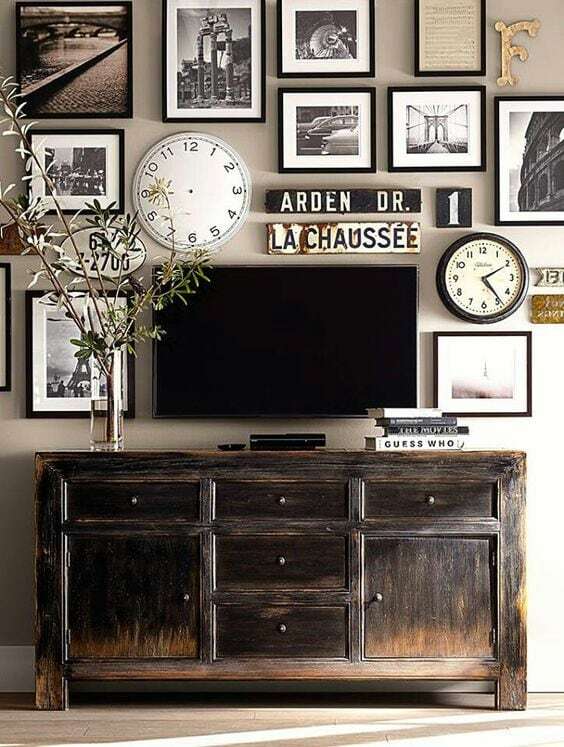 I always love seeing photos of rooms with antiques mixed in but I have never been able to pull that off in my own house. I need to work on that. 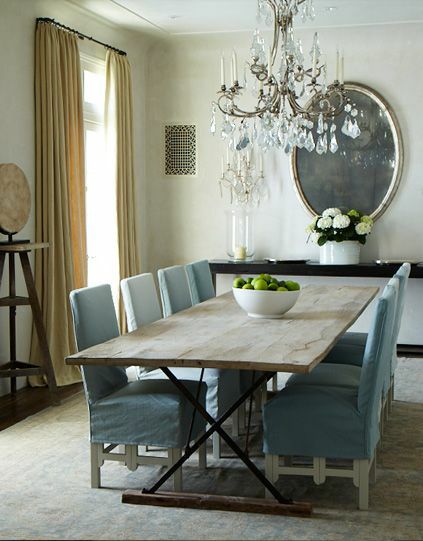 I love your table and I love seeing your family room. It really is a beautiful space! I may have a bit too much vintage in my house:) That top room has me swooning. Thanks for sharing at the Thursday Favorite Things blog hop. Your post has been pinned. I am with you 100%! I feel like soooo many people from my generation just don't get this! Everything is new new new from PB, crate and barrel, west elm, etc… And frankly it's so blah when it's all from "now". I agree a t least *one piece* should be antique, like a beautiful clock, settee, secretary, painting, you name it! I agree a little vintage is so charming in a room! Stopping by from Katherine's party and hope you are having a great week! SUBSCRIBE & RECEIVE MY NEW EBOOK FREE! Subscribe to my blog and receive my eBook FREE!